Dr. James Jacob, President of TotalEdit.com, recently gave an exclusive interview on Scottsdale radio program Money Radio 1510, wherein he spoke about the importance of hiring a professional editing service for your website to attract prospective clientele and lend credibility to your business. Businesses are built upon reputations, and it turns people off if they can’t have that instant trust by either the professional look and feel of a website. In a recent interview on Money Radio 1510, Dr. James Jacob noted the essential nature of hiring a professional editing service to identify typos and spelling errors on business websites in order to prevent making a bad impression on potential clientele. "Over and over again, as people turn to the web for their source of business, they will put up what could be called mediocre or in most cases unedited materials—those which are either unstandardized or just have not had a professional review, a second eye if you will, before it goes public. So this is something that’s common, all web users have run into it, and it’s something that can easily be offset if publishers would just take a little time to take that extra step in business." Dr. Jacob continued stating, "It is a widely accepted assumption that large companies do high quality proofreading in-house, however, TotalEdit.com found that many larger companies choose to outsource the professional editing of their online presence as well as other professional brochures and marketing tools. Some of the largest clients for professional editing are universities throughout the world, as well as some businesses that many would think should specialize in this area." "Businesses are built upon reputations, and it turns people off if they can’t have that instant trust by the professional look and feel of a website. Often just a few clicks is all it takes for people to be sold on the look of a business. That means that a business website has one or two minutes to make a good impression, and it only gets one chance. A simple spelling error or a grammar mistake can lose business. These kinds of mistakes are made by businesses around the world, and it is something that can easily be taken care of with just a little bit of professional clientele and TotalEdit.com is able to help in that regard." 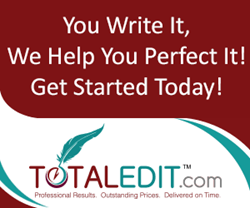 TotalEdit.com specializes in providing professional editing services to small businesses across the country and throughout the world. Many of the businesses and organizations the company works with need to have their websites, brochures, and other marketing materials edited professionally.